Today, Izmir is the third largest city in Turkey. As a bustling city with a thriving economy and cultural life, it’s become a symbol of the modern, Westernized Turkey. However, the city’s prosperity disguises a tumultuous history. Throughout the course of the Greco-Turkish War (1919-1922) the city, known then as Smyrna, witnessed a series of forced migrations. The Greek invaders pushed out the Turkish population when they occupied the city in 1919. The Turks followed suit when they retook the city in 1922. This chain of ethnic conflict and violence culminated with the burning of Izmir in September of 1922, shortly after the Turkish army retook the city. The Lausanne Population Exchange of 1923 formalized the war-driven ethnic separation by exchanging the Christian population of Turkey for the Muslim population of Greece. Plumes of smoke rise from Smyrna (now Izmir) on September 14, 1922. In the decades following the population exchange, the loss of Izmir has been preserved in the Greek memory as a national tragedy, while Turks largely ignore the issue — though they argue that the Greeks burned down the city. This finger-pointing leads to an interesting paradox. Despite its controversial history, the modern city of Izmir is content to simply carry on as if it lacks a history entirely. Though the fire obliterated the physical evidence of Izmir’s pre-Republican history, the city has not undertaken a project to remind its citizens of its past. As someone who spent hundreds of hours researching this city’s history last year, I find this problematic. Ataturk’s visage rises above modern Izmir. 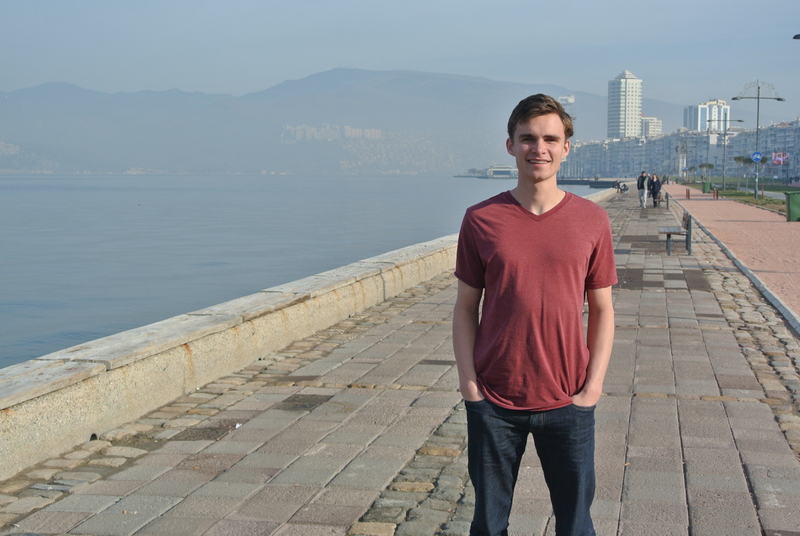 When I visited Izmir as part of a Calvin interim trip this past January, I found myself unprepared for what I saw. As our bus drove through the heart of the old city and along the shore, we passed a Mount Rushmore-esque carving of Mustafa Kemal Atatürk (the Turkish general who retook Izmir from the Greeks and negotiated the population exchange with Greece) chiseled into the hillside commemorating the liberation of Izmir by the Turks in September of 1922. Almost nothing in the heart of the city predated 1922 and I could not find any memorial to the events of the city’s past. It was as if the city did not exist before the founding of the Republic. The huge carving of Atatürk and the large war memorial seemed an exaggerated way of intentionally reminding Izmir’s visitors that the city belongs to the Turks. Furthermore, the waterfront area which had once been home to Smyrna’s famous docks, and where over 300,000 Greek and Armenian refugees huddled in September of 1922, was covered in concrete apartment buildings, chains of stores, and a park. As I strolled through the park, I found myself searching for some sort of memorial or historic marker dedicated to the victims of the tragedy of Izmir. I found nothing. The unsuspecting tourist or uninformed citizen would have no clue about Izmir’s tragic past. The park along Izmir’s harbor. To make matters worse, Orhan, our tour guide, informed me that the park along the water only exists because a proposal to build a highway along the water was rejected some years ago. For someone who knows the story behind this place, such a grandiose expression of modernity constitutes the ultimate affront to the events of the past. It effectively erases any opportunity for Izmir’s present or future citizens to reconcile with the past of their city because the very place where these events took place would be buried by feet of asphalt — not to mention overshadowed by Mt. Atatürk. Historical places matter. Faded photographs and maps cannot compare to the feeling of standing on history. For example, on this trip to Turkey, I experienced a remarkable sense of awe as I entered the Hagia Sophia in Istanbul for the first time. I’ve always considered it to be the greatest building in history, but nothing can describe the feeling of total surrender I experienced when stepping through the thick doors into the 200-foot high sanctuary built almost 1500 years ago. Overcrowded boats with refugees fleeing the fire. The photo was taken from the launch boat of a US warship. Because historical places evoke such strong emotional experiences, I firmly believe that Izmir needs a memorial built upon its shore. The people who lived and suffered through the burning and evacuation of the city deserve this. Furthermore, such a space could serve as a launching point for dialogue concerning Izmir’s past. It could be seen as a constructive step towards healing the wounds of the past. Unfortunately, the refusal of the Turkish government to acknowledge the tragedy of Izmir is not a unique event in the history of the Turkish Republic. Yes, I am talking about the Armenian genocide. As a part of our trip, we met with some representatives of the Turkish Cultural Foundation. They offer internships for recent graduates and college students, and I was interested because their work includes educating Americans about Turkey. However, my interest faded quickly when I realized that a part of this “education” includes lobbying Congress to deny the Armenian genocide. I realize that the Armenian genocide is more complex than the Armenian diaspora claims, yet nothing constructive can come from this sort of historical falsification and denial. Problems are only solved after their existence is acknowledged. Is Turkey, a land with a incredibly rich and complex history, fated to mire in its problems because of a refusal to acknowledge its past problems with minorities? I do not think so. My experiences in Turkey this interim led me to see that Turkey can, and has, dealt with difficult historical issues — such as the British invasion of Gallipoli — in a reverent and respectful way. The ANZAC cemetery at Gallipoli. Constructing a memorial at Izmir would certainly cause an uproar in Turkish politics. However, such an idea is not without precedent in Turkey. On the coast of the Gallipoli peninsula there lies a quiet cemetery by the beach. The head stones are neatly arranged, and the sound of waves against the rocks gives visitors a sense of peace. Interestingly, the soldiers buried there are not Turks. They are the graves of the invaders — New Zealanders, Indians, Australians, and English boys. Above the graveyard is an inscription from a speech given by Atatürk, the Turkish hero of Gallipoli. You are now living in the soil of a friendly country. A memorial at Izmir could have the same powerful effect, though it will take much more political will due to the hostile nature of Greco-Turkish relations for the past century. However, the presence of the Gallipoli memorial offers some hope that perhaps the political charades can end and wounds over ninety years old may begin to heal. Spencer Cone, a 2015 history education graduate of Calvin College, is currently a permanent substitute teacher at Northview Public High School in Grand Rapids, MI where he teaches economics and U.S. history. Spencer is currently looking for teaching jobs in both the U.S. and abroad. His areas of interest include U.S. economic history, Middle Eastern social and political history, refugee studies, and contemporary U.S. politics. Spencer is also an avid rock climber. This entry was posted in Alumni Voices, Student Voices and tagged Greco-Turkish War, history, Izmir, Smyrna, travel, Turkey. Bookmark the permalink. Hello Spencer, I stumbled upon your blog. Your tour guide Orhan was right about the park along the water. It didn’t even exist prior to the 1990’s. Don’t be so harsh on him! ;) It is all reclaimed land that was actually gonna be a motorway and thank god it ended up becoming a park. The area that was burnt in the 20’s is were the “kültürpark” stands today. Regarding the amazing waterfront mansions that used to occupy where the horrible concrete buildings stand today, well thats just building contractors being greedy in the 1960’s. Today Turks off all ages do have a collective idea of how İzmir was prior to the ’20’s. They even yearn for those amazing waterfront buildings. Then again, a nice museum of Levantine Heritage would be nice to have… As a local, I would be more than happy to answer any queries you have regarding Turkey. Regards. Hello Spence nice idea for oppering a such proposal! But what surprises me also is the fact ,that I have never seen such a memorial built against the genocide of native Americans ( the Indians) in the US either and not even to mention about your slavery past and how you have treated black people and still treat them as second rang citizens! My suggestion to you is first to propose such ideas to the Trump administration before worrying about turkey and what happened there in the past. Because the events in America happened far long before those events in Izmir. However thanks for showing interest in Turkey and in Izmir in particular. I would like to ask you to correct the inaccuracy that Greeks invaded Smyrna. Smyrna was passed to greek administration according to the Treaty of Servres signed in 1920, with Ottoman empire being one of the signing parties. There is huge difference between change of administration (and of course this requires establishing army and security forces to maintain order under the new administration) and invading, which is what the Nazis did in Poland, Netherlands and so on. Greek army entering the city, and the massacre that took place two years later are two events of completely different scale and cannot be compared. I appreciate that you would like to not choose sides on this, but by treating the two events as if they were of equal caliber, you essentially do take sides and don’t do historical justice. Thanks.